Trump retains support from a majority of voters in 12 states ranging from the Mountain States to the South. The president retained support from a majority of voters in a dozen states in September, all of which he carried in 2016. Trump is most popular in Wyoming, where 60 percent of Cowboy State constituents said they approved of his job performance as of September, followed by West Virginia, where 59 percent of Mountain State voters approved. 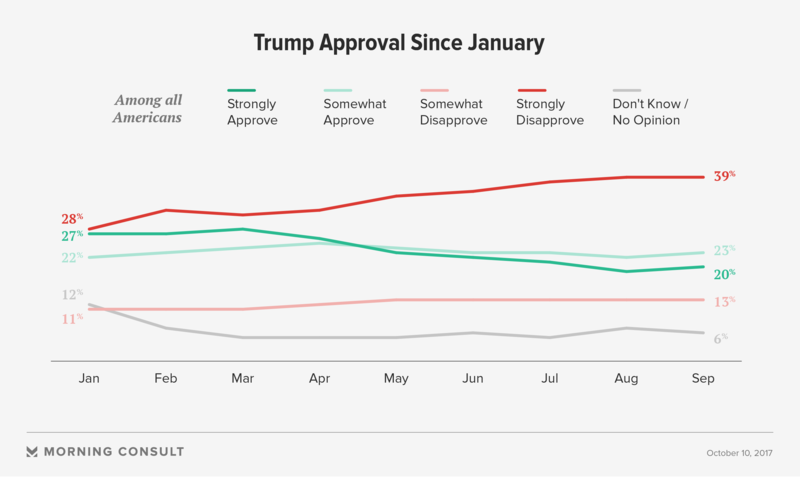 Trump’s approval in the Deep South is highest in Alabama, at 59 percent, while 57 percent of Louisianans, 54 percent of Arkansans, 53 percent of Tennesseans and 51 percent of South Carolinians are still in his corner. MC/WASHINGTON: SUBSCRIBEGet the latest news, data and insights on politics, policy and government. Hmm, maybe we should try “2nd Amendment” “buttressing” with Propping Up “bump-start”, and ADDING, automatics, silencers, bazookas, and grenades to “open carry” for a 90 month trial (for “home protection, of course”). I’m all for protecting home-locked-up hunting guns with safety devices and other enhancements., but maybe if we went in the Other direction for 3 months we could get a Real spectacular that would return the NRA to the sane organization it once was. A terrible price to pay but it wouldn’t take long for the 500 to trigger legislation that would eliminate some of the 12,000 deaths by gun each year (and that’s down 40% from 1995). Maybe if FIVE HUNDRED people were lost, we’d take a second look at Australia and sensible gun policy. As with so much, we are becoming an international freak-show (how many “are hearts go out to…. and to our brave first “responders”) are we going to go though. Hello!–it’s not just a mental health problem Or a flood of guns, some of which were illegal until fairly recently (I.e.. banned by federal law). IT’S BOTH.